Outstanding amenities, private beaches, and free boat access to Lake Winnipesaukee make The NASWA Resort the ideal place for your next tropical vacation. The picturesque sunsets are complementary with any meal at our beautiful restaurants on Lake Winnipesaukee, whether our guests choose to dine at The Blue Bistro or grab a cocktail at The Nazbar & Grill, they’ll enjoy great food and good times in the best New Hampshire cabins and cottages. The Blue Bistro in the heart of our beautiful Naswa resort offers creatively crafted meals to visitors in one of the best Laconia New Hampshire restaurants. At The Blue Bistro, you’ll be able to enjoy delicious dining with delightful views of Lake Winnipesaukee while staying the heart of our lively resort. Start your day right with our lovely breakfast menu for all the classics you love, as well as new flavors like our Caribbean French Toast, and fluffy omelets. Discover our chefs’ creative and modern cuisine including fresh seafood, fresh vegetarian dishes, and certified Angus steaks, something for every palate. Save room for a delicious “Hope Made” desserts, from our matriarch, Hope Makris. Our team is committed to always using locally grown produce and fresh ingredients, even in our children’s menu. Make sure you get a taste of both our restaurants on Lake Winnipesaukee. The Nazbar & Grill welcomes you with a cold tropical drink and various tasty food options, for lunch or dinner, or both at one of the tastiest Lake Winnipesaukee restaurants. Experience an ideal beachside meal, complete with live entertainment is provided Wednesdays, Saturdays, and Sundays. Check out our Weekend Celebrations for details on live entertainment and specialty menus. Come find out how we were named one of the Top 20 Boating Hot Spots by Powerboat Magazine. We’re even a great place to take shelter on a rainy day, thanks to our tent and heaters that cover the whole area, let’s not forget our TVs. The Nazbar & Grill is the hottest nightlife spot on the Lake, guests and locals alike gather for a good time. Embrace the tropical vibes that surround you, as you relax by our fire pits with a tasty drink as you rock to a reggae beat until the picturesque sunsets at dusk. Book your stay at The NASWA Resort, for a tropical getaway in one of our restaurants on Lake Winnipesaukee. 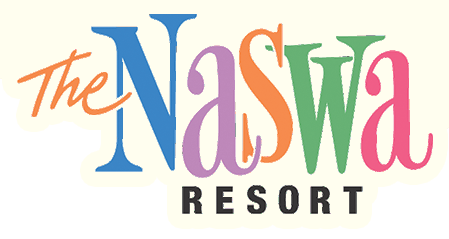 Shake the Winter Blues: Plan your NASWA Getaway!